The gite Chez Ming is a comfortable self catering gite holiday home apartment in the charming village of Catus near Cahors in the Lot, South West France. The gite is close to major tourist sites of the south and SW - in the Dordogne, Lot & Garonne, Aveyron, Tarn & Garonne, Correze - and only 2-3 hours drive to the Pyrenees and the mountains of the Cantal. You are invited to browse through our pages to discover what we at Chez Ming Gite and this lovely area around Cahors in South-West France have to offer to make yours a memorable and enjoyable holiday. The gite self-catering holiday home apartment has a private terrace with access to a large secluded garden bordering a stream. A quiet and tranquil place for a relaxing holiday. A delightful 2-bedroomed self catering holiday home apartment for 4 in the lovely, unspoilt countryside of the Lot département of South West France. The gite is only 15kms from Cahors and less than 1 hour's drive to popular tourist sites such as Rocamadour, Sarlat and St Cirq Lapopie and only 2-3 hours drive to the Pyrenees. 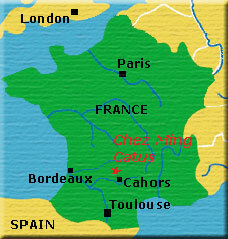 Chez Ming is located near Cahors at the edge of Catus, a village that still shows evidence of its medieval origns and typical of SW France. It has a few essential shops and services. 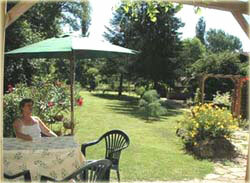 The Lac Vert leisure lake is just 1km away from the gite by a footpath alongside a stream, or by road. It has bathing, a cafe/restaurant, picnic, sporting and other leisure facilities.